The Transportation Association of Canada (TAC) is proud to acknowledge those members who have made contributions to improving transportation in Canada, through our awards program. Each year, TAC’s councils receive award nominations, coordinate their review through a selection committee, and approve the winning submissions as examples that highlight innovations, best practices, and lessons learned in the execution of real-life projects that advance transportation. 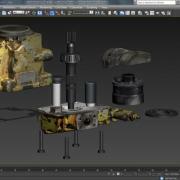 This three-dimensional virtual learning tool allows users to view and interact with models in a virtual simulated platform. Such tools allow instructors to create immersive learning experiences where students interact with content in a meaningful way that closely simulates real-world application. The virtual training environment results in better-trained technicians who are able to perform both diagnostics and repairs quickly and with fewer errors. It results in lower maintenance costs for customers and better-performing cars, trucks, ships, planes and trains. York Region’s 2nd Concession corridor crosses Rogers Reservoir, a popular conservation area in the Town of East Gwillimbury, Ontario. To address local growth, between May 2014 and June 2017, the two-lane road was widened to a four-lane urban arterial along with an elevated wooden boardwalk. 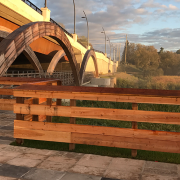 Three new bridges, one over rail, the Holland River and a wooden-clad pedestrian bridge, serve to protect and preserve the historic canal system. Echelon plowing is the practice of staggering snow plows across all lanes of a multi-lane highway during snow-clearing operations. It is, however, extremely dangerous for motorists to pass between or around the snowplows while in this formation; whiteout conditions can exist between two plow trucks. There is a danger of hitting the back of the right side wing plow as it becomes obscured by snow. A “Safety Swing Arm” was developed in 2013 to reduce the number of collisions between snow plows and vehicles. 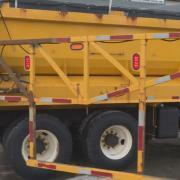 The “Safety Swing Arm” consists of a 2.7 meter mechanical arm with lights installed on the back of a lead plow truck. When the right side wing plow is deployed, the arm simultaneously extends to create a visual and break-a-way physical barrier between motorists and the right wing plow. The “Safety Swing Arm” has proven to prevent passing vehicles hitting the right wing during poor visibility conditions. The City of London and its partners developed a road safety strategy to improve safety for all road users in 2014. The goal of the accompanying action plan is to achieve 10% reduction in fatal and injury traffic collisions within five years (by 2019). The plan identified six emphasis areas including intersections, aggressive/distracted drivers, young drivers, pedestrians, cyclists, and red light running. During the development of the plan, various innovative mechanisms were utilized to obtain feedback from the public. The strategy development and implementation included several innovative features. The City’s Road Safety Committee, which included a cross set of skills such as engineering, communications, public health, law enforcement and school boards, identified opportunities to work together to implement countermeasures. 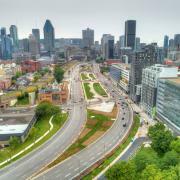 Ville de Montréal has owned a section of the Bonaventure Highway located between the Lachine Canal and Notre-Dame Street West (where the fast lanes end) since construction in 1966. Rather than investing to extend the useful life of this elevated structure, which created a major barrier in the urban fabric, the City has chosen to replace it with an at-grade urban boulevard. The tree-lined median features wide sidewalks and a series of public squares and open areas. 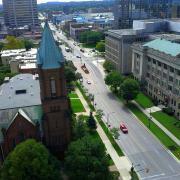 In addition, this boulevard is punctuated at either end by a major public art installation. These award winners were selected from over 20 nominations, and will receive their awards at the 2018 TAC Conference & Exhibition on Monday, October 1 in Saskatoon. They will also take part in special conference sessions that provide an overview of their award-winning work.